Thinknet » Namesake Dialog: Can startup investors really “save” academia? Namesake Dialog: Can startup investors really “save” academia? Namesake.com: Can startup investors really "save" academia? For my recent Ph.D. I decided to research the foundations of a new field, Systems Engineering that is just getting started in Academia. I had been invited to speak on the subject a couple of times at INCOSE when I was doing Software Engineering. So when I become a Systems Engineer myself I decided I really needed to look into this question deeply and that led to a Ph.D. in that subject. And I loved every minute of it, because it gave me the focus to actually accomplish something in that field. I just gave a talk at CSER2011 about my results a few weeks ago which you can hear on my research website and it was also about the next steps in my research program. But you can judge for yourself. See http://about.me/emergentdesign It has allowed me to get a credential in my chosen field. 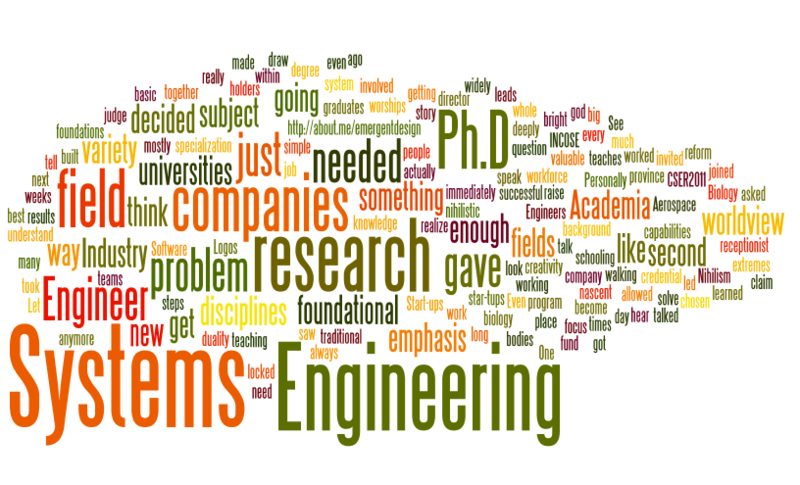 Personally I think in Systems Engineering there is not enough foundational research. It is mostly about teaching what is the traditional way of going about doing the Systems Engineering work in Aerospace companies. Start-ups are not going to be able to fund foundational research. Even big companies do not do that anymore. That will always be the province of universities, and it is needed if bodies of knowledge are to be built up in nascent fields like Systems Engineering. But what is needed is for star-tups to realize that graduates with Ph.D. holders are valuable even if their degree is in another field. Let me tell you a story about that. One place I worked the director of Engineering was walking in to the building one day and he saw a new receptionist. So he talked to her and asked her about her background, and she said she had a Ph.D. in Biology. He said, what are you doing here with this job. She said it was all she could get. He took her up to his office and immediately gave her a raise and made her a Systems Engineer. This was long before I joined the company. When I got there she was the best Systems Engineer they had. And that is because biology teaches you to think about the whole system. She had learned that in her schooling, which is something that most Engineers do not understand. There is too much emphasis on Experience and not enough emphasis on capabilities. That is the only problem, companies need to draw widely from various disciplines. Those companies that do that will be more successful because there will be more variety in their workforce and I claim that this variety of disciplines working together leads to more creativity of the teams involved. The problem is that many bright people are locked out of fields because of the way that Industry worships the god of specialization just like the universities. Academia is Logos and Industry is Physus. This is the basic duality in our worldview. But they are both nihilistic extremes. No simple reform will solve the problem of Nihilism within the Western worldview.